Are you going to marry in the next weeks or months? or you need a visually impressive wedding design for your new client? you’re in the right place. 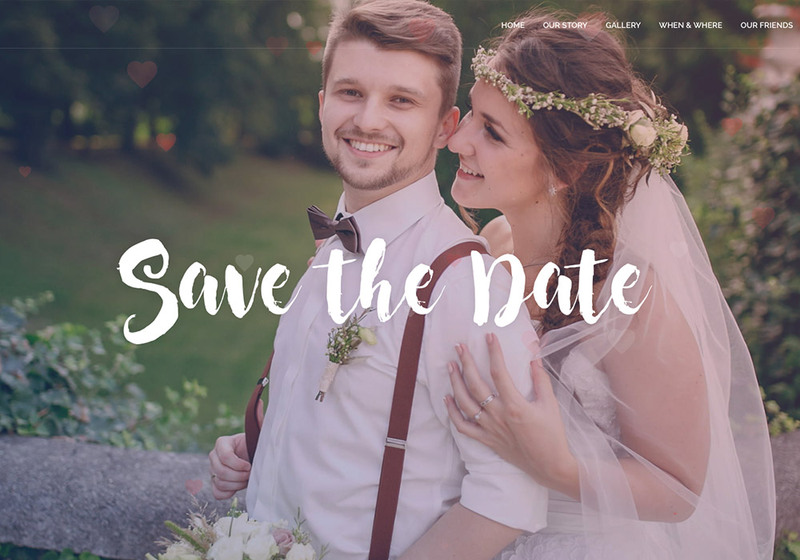 Stay with us for a couple of minutes to get familiar with some outstanding Wedding WordPress themes all created in 2017. 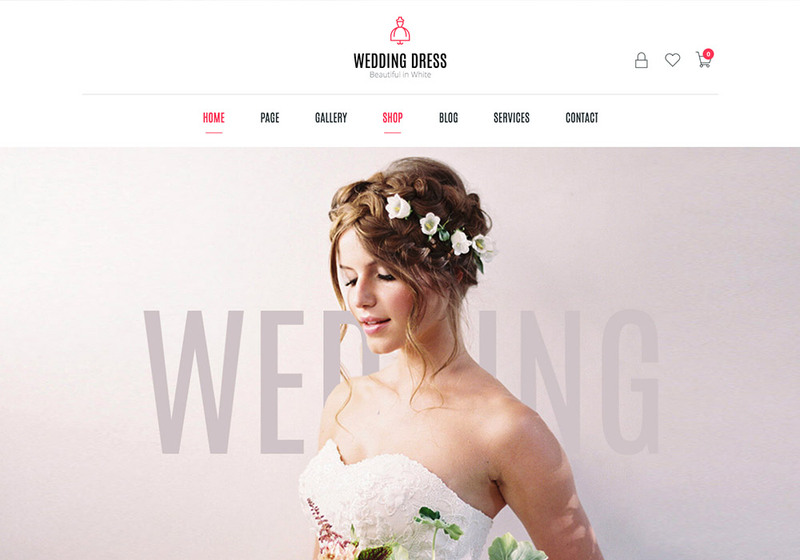 In this roundup, we handpicked 9 attractive wedding WordPress themes with amazing functionalities. All the themes are built with the latest WordPress standards offering the best solutions for common wedding websites requirements. 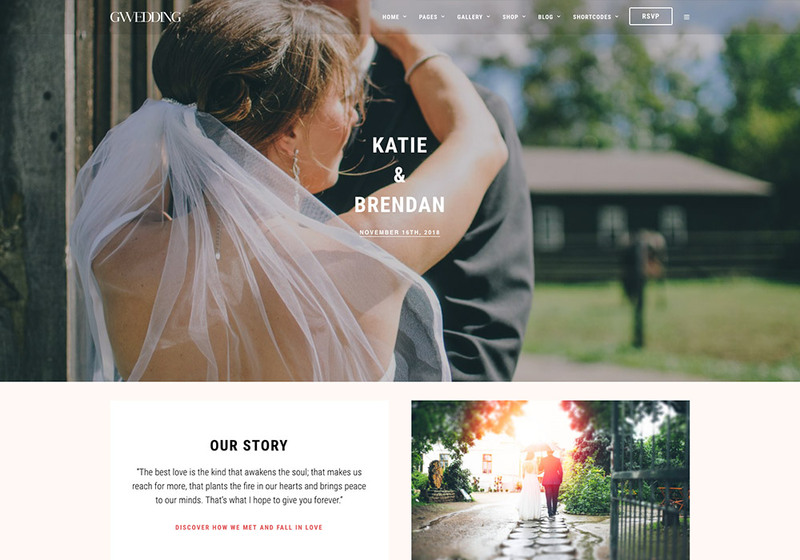 Wedding WordPress theme is an engaging, clean, responsive theme designed for wedding websites. It offers both one-page and multi-page options for your website. If you like to showcase your wedding photos, videos, and memories in a beautiful and impressive manner, Wedding theme is an ideal choice for you. It is focused on providing all you need for your upcoming big day. This theme is totally responsive and furnished with all good features that can help you build your dream wedding website. Its twenty demo modes will help you be creative in building a website for almost any type of wedding businesses. The Wedding theme can be used to build a romantic story or journey, wedding event, party schedule & RSVP form. Also, it’s a good choice for wedding agencies and related businesses. OneLove is a theme that’s been purpose-built for anyone creating a website for wedding websites such as personal wedding website, marriage anniversary, wedding planning agency, wedding planner, wedding shop, and wedding blog. It also provides the ability to communicate with your guests, by letting you share your wedding event details, sharing happy moments with them, showing a countdown, inviting form and much more. With OneLove, you’re free to change everything to make sure your wedding website is unique & beautiful. Change colors, fonts, and elements easily. You can start with the current demo and import it with only ONE CLICK. OneLove’s 19 demo versions are at your disposal, helping you to create almost any sort of wedding website as easily as possible. You can even create an e-commerce shop as it offers premium WooCommerce integration with multiple product styles to choose from. OneLove also includes a few lovely portfolio layouts which allow you embed your photos and videos in a professional and elegant manner. 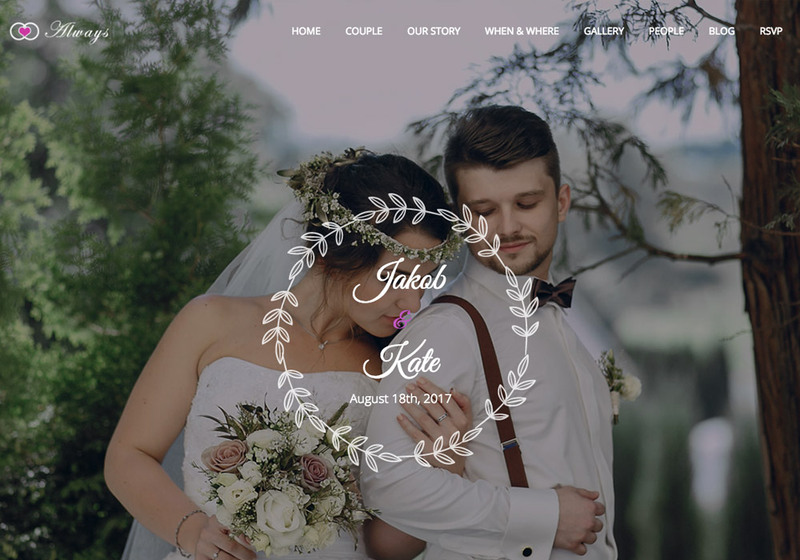 Finally, you will probably fall in love with this lovely Wedding WordPress theme if you take time and browse the demo, specially this one-page version! Grand Wedding comes with multiple design concepts and page layouts for wedding-related websites and businesses. It’s an all-in-one solution for your personal wedding website, wedding planning company, or any related websites. 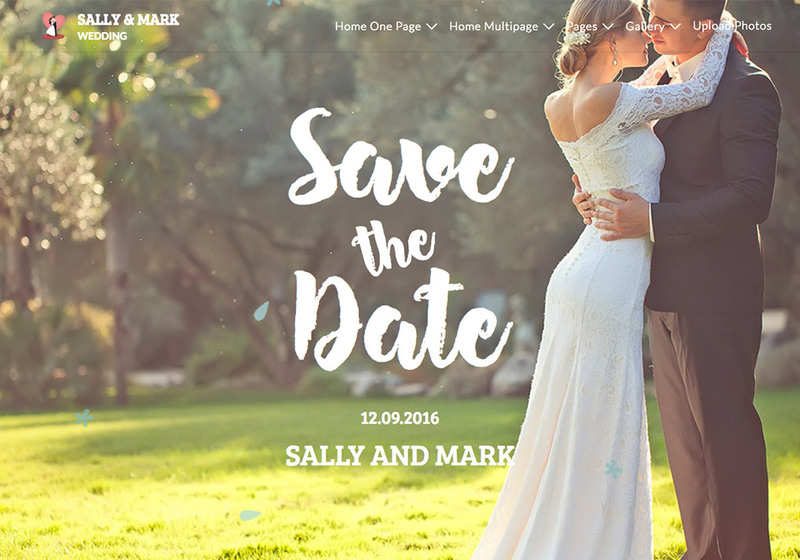 The demo versions focus on different types of wedding websites such as wedding announcement, wedding invitation, wedding planner, wedding photographer, wedding venue, wedding fullscreen video and fullscreen photographer. ThemeGoods the company behind Grand Wedding WordPress theme offers Free theme installation & demo import. This free service will help you get your site just similar to the demos but under your own domain for free. This theme includes a RSVP form which is totally customizable meaning that you can add new custom fields for example meal preference, number of people etc. Actually, the form is based on Contact Form 7 plugin which brings this level of flexibility by itself. Of course, you can manage the RSVP submissions from WordPress dashboard. Grand Wedding comes with multiple gallery layouts with various options, letting you select from fullscreen, ken burns, columns or horizontal versions. Your wedding or event information is shown in the most modern way possible which is a Map with information popup on it. And finally, the cool countdown element is here to encourage your guests to do the reservation as soon as possible, and the free premium plugins add more value to the product, iLightbox, and Revolution Slider. The wedding is a handsome, flexible, resourceful, sophisticated yet simplified Wedding & Wedding Planner WordPress theme made for every groom and bride! The stylish, bold, and innovating design of the Wedding theme, as well as over 10+ pre-designed homepage layout, are at your disposal to create a piece of brilliant artwork for your biggest day of your entire life. With the power of the premium Revolution slider which is included for free, you can easily create impressive slideshows with some unique, modern and professional looking effects to show off your wedding events in a modern and attractive way. As you scroll down, the structure of the premade demo content seems so inspirational, starting from a big animated poster with the groom and bride names on it, the love story section continuing to the wedding information such as The Ceremony, Reception, and the Party schedule plus a bold memorable working countdown, to an attending form your lovely guests. And if you run a wedding planner agency, there is a dedicated demo version for your business too. Empowering your business by offering predesigned elements and ready to use templates. You can show off your services in an elegant way using custom icons and showcase your recent works for your happy clients. There is also a seamless integration of WooCommerce for selling your company’s products all on one website. Overall, Wedding is an ideal choice for those who are in love with clean, robust, and functional designs. What a big day is the wedding day. You do your best to make it memorable and yes, the happy moments deserve being ever-lasting. From our list of fantastic themes for Wedding websites, meet Glanz, a clean, flat, and visually stunning one page & multi-page site Wedding WordPress theme crafted with a range of incredible features. The typography is thoughtfully designed to bring the right feeling to your guests as well as the background music which is an engaging feature. Also, the animated GIFs which are located at the beginning of each section; they are fantastic! 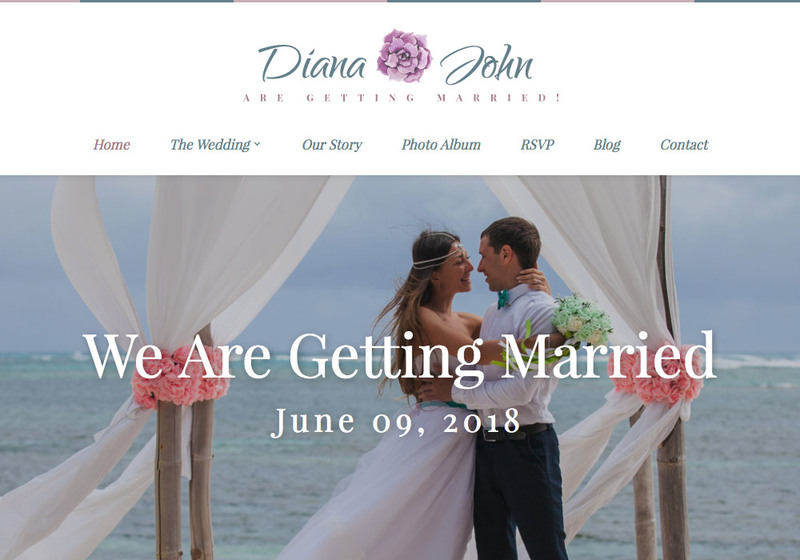 Glanz includes 8 excellent demo versions for you to choose from which can be imported easily helping you build your best wedding website effortlessly. If you take a look at some of its demos, you will get noticed of the extensive design effort invested in this design-driven WordPress theme. One of Glanz’s standout feature is the invitation template which comes in 4 unique designs, pink, green, purple and red. The event invitation and wedding announcement templates used to impress your guests. It even comes with custom shortcodes especially designed for wedding websites such as When & Where blocks, friends blocks, about us, RSVP and the animated blocks. Glanz is the ultimate on-stop solution for wedding-related websites and businesses. Don’t miss it out. Always and its six demo modes will help you build a website for almost any type of wedding-related purposes including personal wedding website, wedding planner, wedding agency, celebration management, etc. It’s packed with amazing functionalities, user-friendly interface, robust SEO framework and graphically impressive design. Using the superbly easy to use King Composer page builder, unlimited freedom, and incredible features are at your disposal at no cost. The included page builder is well-known for its convenient usage and the completeness of the features. The design is clutter-free, focused, and entirely modern with attractive sections such as a nicely-framed countdown, polished events boxes, stunning photo gallery, and a beautiful RSVP form. 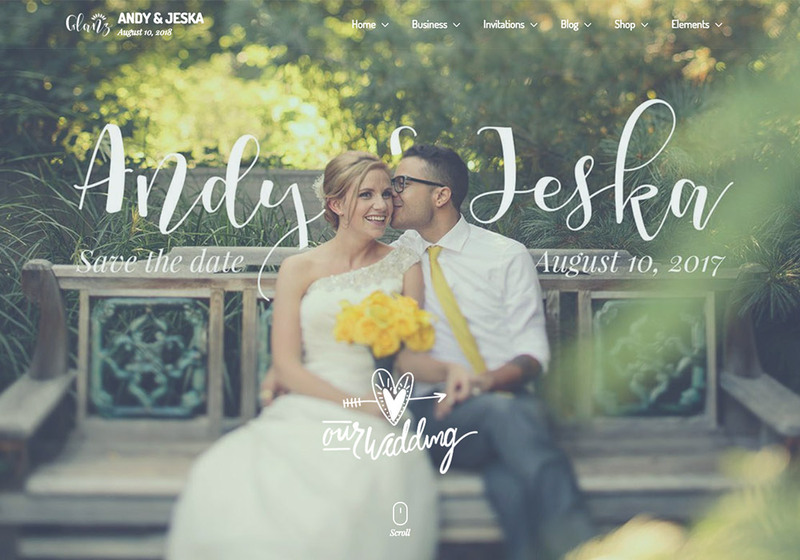 With Always wedding WordPress theme, you have a total control over the elements, templates, and styles. Feel free to play with the theme options and find your own unique style which works for your wedding. It’s totally customizable without touching any code. Lastly, you can import the demo content and install the demo with just one click. EndlessLove is designed for wedding related websites which brings beautiful & amazing experience to your visitors. The theme includes 2 unique homepage design concepts & more than 90+ sample inner pages that come handy to create your own personalized website. With EndlessLove you will have access to a wide range of exclusively designed features for wedding-related businesses and websites. It includes a number custom crafted shortcodes created to make your life easier. FAQ, team pages, timeline, gallery, friends, party, and other components are at your disposal to present your website in a professional manner. EndlessLove is optimized for mobile devices so your mobile visitors are covered too. It’s fully responsive. 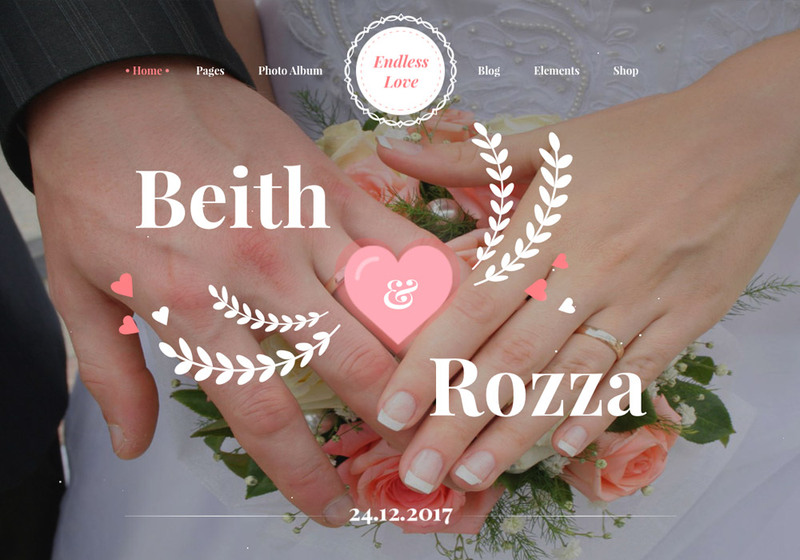 Whether you’re going to marry soon and need a website where your guests can reply to your invitation or run a wedding agency serving couples, Endless Love will be an ideal choice for you. Special Day is a new WordPress theme created exclusively for your wedding day to make it a special day. First of all, the design looks unique at least to me because of the fantastic typography and overall template structure. It’s minimal yet sophisticated. The countdown to the wedding day is mixed with the couples’ photos in a memorable and functional way. The design is clutter-free, clean and functional and you don’t see excessive animations or elements. Other typical pages are included such as groomsmen, bridesmaids, gift registry, love story, RSVP, and blog. Actually, you’re not limited to above pages because this theme is backed with a strong easy-to-use page builder which brings endless possibilities at your disposal with a neat convenient drag-and-drop interface. 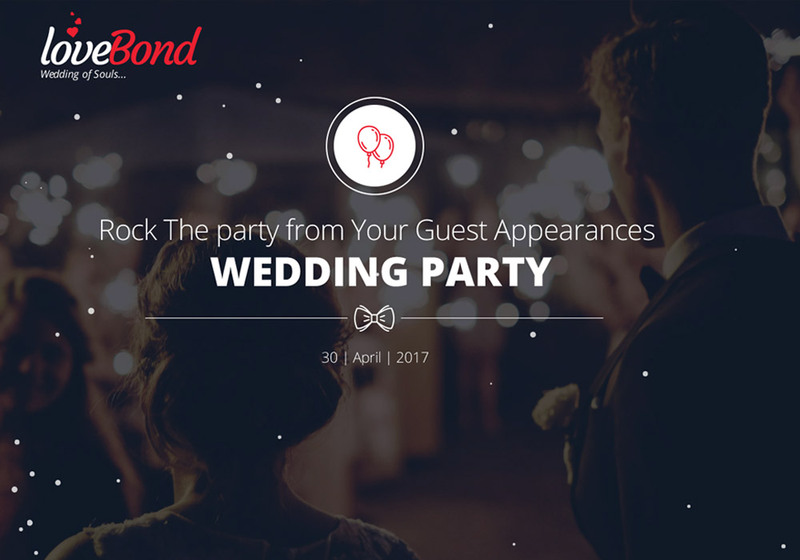 LoveBond could be a great choice if you’re looking for a creative WordPress theme for your wedding day or your clients at your wedding agency. It can be used in personal wedding websites, marriage anniversary, love dating and other awesome wedding websites. LoveBond is a more design-driven theme with a focus on uniqueness. Using this theme, your wedding website will stand out among other wedding websites because of the brave innovative design concept. In term of the required features, it offers the most essentials including Bride/Groom, date of marriage, events, RSVP, and blog.